I have 2 identical 100W solar panels each with a built-in PWM controller connected to 2 x 130Ah 12V batteries wired in parallel. The 2 panels connect to a bifurcated cable with Anderson plugs so that a single O ring connects to each battery terminal. I enquired with another solar panel supplier about adding one of their 300W panels which also has a PWM controller. They said that you must only use one controller per solar panel array / battery bank. My 100W panels each have their own built-in controller and they are hard wired so I can’t see how I could modify the wiring to make them both charge through one controller. The supplier of those panels didn’t say anything about using a single controller with both panels. I’d like some clarification about connnecting multiple solar panels and controllers to a single battery bank. I have 3 pv arrays feeding 3 controllers (2 mmpt & 1 pwm type), plus 2 AC chargers connected to a single 48v bank. It generally works fine. Multiple panels (an array) to a single controller is fine, providing wiring is done right for the controller used. Multiple charge controllers (esp. mppt type) connected to a single panel/array can be an issue and should generally be avoided. Multiple charging sources to a single battery/ bank is generally fine. A potential issue can be controllers changing charge state independently (eg one goes to float before others). In general, this isn't a big issue though. Contrary to the advice I was given, is it actually more problematic connecting multiple solar panels to a single shared controller as opposed to each panel having its own dedicated controller? So each solar panel connected to a battery bank can and should be independent of the other and charge through its own dedicated controller? I also have an inverter connected to the battery. If I connect more panels to the battery then I’m potentially going to run out of space on the terminals to fit the O rings and washers onto. Is there some kind of adapter available to solve this problem and create more terminal contact space or is the solution to use fewer and higher wattage panels? Think you may be in an evolution stage, trying to adapt a small system to integrate with larger components can be problematic, many/most have begun doing such experimentation, but short cuts can slow you down. When serious about building a new system it's better to design for needs and use redundant components for other purpose should the need arise. Multiple panels to a single controller can be fine, as long as the wiring and controller are right. I have a total of 18 x 250w panels wired in two array of nine, through two mppt controllers, to a 48v bank. Also a third array of 2 x 300w panels, through a pwm controller to the same bank. In your case, the 300w panel with inbuilt controller may or may not work. A panel that size would typically have a working voltage of ~38v, and with a pwm controller would likely be for a 24v nominal bank. It may be wired internally as 2 x 12v nominal panels in parallel though, with a shared 12v nominal pwm controller. If so, it could be added in parallel with your existing 12v nominal panels. Rather than stacking more on crowded battery terminals (inefficient and potentially unsafe), what's often done is to have a single pair of heavy wires going from battery/bank to a positive and a negative buss bar. These can be bought premade (eg from our hosts), or can be DIY from copper bar or tube stock and SS bolts. Controllers, inverters, etc are connected to the buss bars (with wire and breakers/fuses sized for the particular device). I’m looking at adding a few devices like a fridge/freezer and a 4G booster and thinking my 2 x 100W panels won’t be sufficient to replenish the 260Ah battery bank if I’m regularly discharging it to 50% SOC. So I’m thinking that adding another 300W panel will make sure I’ll be able to replenish what’s consumed. I don’t anticipate that my system will need to expand any further than this. So is it ideal and preferable for each solar panel to have its own separate controller? These are the specifications for the 300W panel. I believe it’s designed for 12V battery systems. No, I wouldn't say it's ideal or even preferable to have a separate controller for each panel. It very much depends on the specific application, but in most, multiple panels on a single controller works fine. It does appear to be 12v nominal panel(s). Not sure about a 10a max series fuse with Imp of 16.6a though? Adding fridge/freezer to a system generally moves system size up a notch or two. A typical AC fridge is ~1500wh/day, and needs an inverter big enough to start it. A single 300w added panel is unlikely to support this addition on a daily, year-round basis. It may work for something like a weekend summer cabin though. Boosters can also use a fair bit if left on 24x7 (I think mine would be on the order of 5-600wh/day + inverter losses). I turn mine off when not in use. As @mcgivor suggests, you may be getting to a point where it's worth thinking about what a future ideal system might look like. Alternatively, you could go ahead with some extra pv for extra loads, and maybe a generator for now. This is a setup for week long camping trips. The 12V fridge/freezer I'm looking at is rated at 3A on freezer so by my calculations that's 864Wh per day. I think my 260Ah battery bank is sufficient to power the fridge/freezer and other appliances that I need to and if not I can add another battery. It's more a question of whether I have enough wattage with my solar panels to replenish what is consumed. My feeling is that if I just add that 300W panel to my current setup that it will be sufficient. However, the 4G booster uses more power than what I thought so might have to keep that switched off when not in use as you suggest. DC fridges do tend to take less to run - the DC chest fridge/freezer on my boat runs in the ballpark of what you suggest or a bit less if it's only filled with precooled stuff. DC also avoids running an inverter big enough to start an AC fridge, which could use a few 100s of wh/day. Overall, maybe 1/2 the consumption of a typical AC fridge, so the extra panel may well support the load. Excluding the power drawn by the inverter itself, would a DC fridge/freezer use the same amount of power if it’s connected to an inverter as it would if connected via DC? The calculation for the refrigerator 864Wh would be based on a 100% duty cycle, probably a good way to estimate on the safe side, the amount of harvest really depends on location, both geographic and physical. The 12VDC refrigerator seems very efficient with no inverter needs but it is important to remember the solar modules need to be in direct sunlight without shading of any sort and positioned correctly. 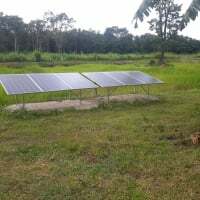 This is not the easiest task on a mobile application, usually means parking in an open area, or by using a movable array, either way it's prudent to not build too conservatively based on proposed useage, most successful off grid users have more capacity than needed to not only get through times of poor sun, but also to recover from these times. From the information provided regarding panels with their own controllers I'd be inclined to use multiple modules in parallel with a single controller, rationale is there would be a single charging algorithm which is more precise than multiple sources.There are excellent PWM controllers available at reasonable costs, some of which can be programmed to suit specific needs of the battery, naturally cost is relative to the individual but a professional unit can be had for less than $200, down to a generic one for $50 or less. What I've found with DC vs AC units is the DC (at least the common Danfoss based ones) tend to be better at keeping stuff cool than getting them cool. Some have provision to adjust speed, but even on high speed they tend to cool slower than an AC unit. Overall consumption varies a lot with box insulation, ambient temp, etc. My boat unit isn't all that well insulated, and uses ~750wh daily. A similar sized but heavily insulated unit I built in the cabin uses ~150wh/day. I’m looking at a fridge/feeezer with a Danfoss compressor. Even if they cool slowly, will drinks placed inside warm eventually cool to the same temperature as they would in an AC fridge? Would they be capable of doing this and keeping meat frozen with very high ambient temperatures (over 40°C)? Would it succeed but consume a large amount power? I’m trying to justify the investment over using ice boxes replenished frequently with ice in terms of efficacy (drinks kept as cold as an AC fridge and food kept snap frozen), convenience (not having source and pay for ice and keep water drained to stop food getting waterlogged) and cost. With a 260Ah battery bank, the DC fridge/freezer will potentially consume over half of the daily available charge assuming the battery bank can be fully replenished each day. Whilst this seems like an adequate battery bank, I can see that it is going to be challenged if a day or 2 of poor direct sunlight exposure occurs. Given I already have panels each with their own built-in controller that I can just plug in and go, is the benefit of using a single controller worth the potential additional cost of another unified controller (not sure whether I could just use one of the existing ones) and the time to research how to rewire the system to make sure I know what I am doing? If the evaporator is a box type with a door, I've found frozen food stays frozen in the freezer box in the boat chest fridge/freezer. Warm food/drinks will eventually get cold, but just take longer than an AC fridge. The effect of high ambient temp will depend on the box insulation, if not a chest type, frequency of door opening. To help with power consumption we sometimes get a block of ice and put it on the bottom of the chest fridge/freezer. It lasts quite a while. If the panels already have controllers, I see no good reason to use any additional controllers. As mentioned above, having multiple controllers on a bank is generally fine. Can you provide a link to the panel with integrated controller, as well as the 300W controller, or do you know the specifications? There are different charge algorithms for different battery types, whilst it is possible to have multiple controllers work if all follow the same charge profile, not knowing the the specifications makes it difficult to say definitively one way or another. Having a single controller with a display, can provide information at a glance wether the battery is charging, discharged, in float or some other state, they also provide low battery cut out to protect against completely discharging the battery. The charge controller specifications are the most important, what type of battery are they designed to charge, AGM, GEL, Flooded lead-acid or some other type, each have particular voltage requirements, so it's important to have the correct value. For example, if one is designed for flooded lead acid, it would damage an AGM lead acid by overcharging, conversely if designed for AGM, it would undercharge a flooded battery. These characteristics may not appear immediately but will result in problems over time if not the correct values. These are the very basic requirements, batteries in hot or cold environments need compensation to increase or decrease voltage depending on temperature, better quality controllers have this capability with a teperature sensor attached to the battery. In short it depends entirely on expectations, saving money is often more expensive, in the long run. I have never heard of solar panels with built in controllers so I can not comment on that. I have two systems side by side that can be coupled. I use MidNite controllers for charging and it works fine. The controllers do not equally share the charging duties with one controller going to adsorb or float before the others. Most times I will have one Classic 150 and one Kid on each bank, but when I have inclement weather all four controllers are assigned to one bank. I only parallel the bank's when using very large loads due to the fact that the batteries are not a matched set. One bank is 4 X new interstate L-16's and the other are 4 X Rolls-Surette S-530's L-16's salvaged from recycle, they are over 10-12 years old or older. This works well as when separated they get a full charge and get to 1.265 s.g. And are equalized. No problems at all. Sometimes the Kid controllers are assigned to other duties. My systems are allways changing, sometimes daily. on the referigerator , I am using two Grape Solar GS-5 units. These have a Chinese knockoff of the Danfoss compressor , The Colku. I am using 200 -250 watt hour per day per unit. Have Chinese volt/amp/watt meter on each unit for data logging. Use is in 38 foot fifth wheel travel trailer which is used as a house in mountains. Heated space at 65 degrees. Grape Solar has since exited the referigerator business, too bad , these are great units. Purchased at Home Depot Online for about $800 / one unit.